The Druze people are 400,000 living in Syria (mainly in the area of Jabal ad-Duruz or Druze Mountains), Lebanon and Israel. The Druze flag is the same in all of them. During my visit of 2 October 2001 to Mas'ade, the only flags I spotted were Druze flags in 1:1 ratio. When I visited Peqi'in (Buqei'a) in the Galilee, I saw the same flag. 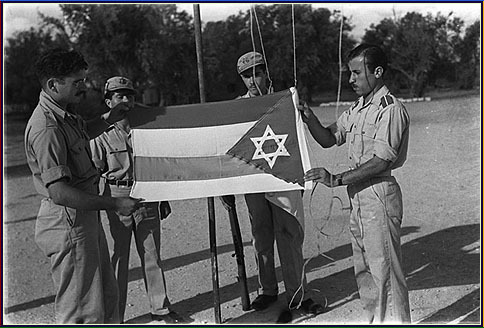 During my surfing in Hebrew sites I found a black and white picture showing the flag of the Israel Defence Forces (IDF) Druze soldiers in 1948. The picture is in the Druze page at Snunit site which is the Jerusalem University site. The flag has four horizontal stripes and a triangle with a Magen David on it. I saw the real IDF flag and the order of stripes is the same as the regular Druze flag (red-yellow-blue-white with a white Magen David on the green hoist triangle). My brother, Eli Gutterman, sent me a link to a short film that was taken in Israel in 1951. The film was sponsored by Air France but it is narrated in English. It is a little over 9 minutes and can be seen at www.readme.co.il. 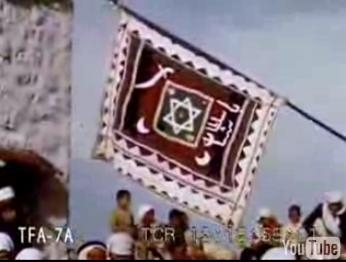 Close to its end, there are scenes from a celebration in the Druze village of Beit Jann in which a unique flag is seen. The flag is a combination of Druze symbols ((sword, crescents, the inscription in Arabic "Sultan Basha" (a.k.a Sultan Pasha al-Atrash - a legendary Druze figure and the leader of the Druze revolt of 1925)) and the Israeli Magen David. I received a fax from Zvi Ruder with a photo of Israeli Druze flag, which I never saw before. I scan the photo which is in poor condition after being processed through fax machine. 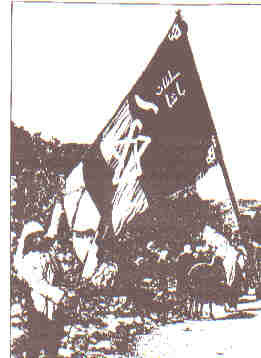 The Arabic inscription on the flag is Sultan Basha [=Pasha] which is the name of a famous Druze leader. In the Flags of Aspirant Peoples chart appears "28. Druzes - Israel". Horizontal green-red-yellow-blue-white with a white solid Magen David shifted to upper fly (centered on red stripe). Since our experts from Israel report something rather different, I assume this flag is a mistake. There is no way it can have a light blue stripe unless somebody saw a faded flag. It should be dark blue like the image at the top. As I mentioned already, this is a probably ad-hoc flag, and I never saw one like it. Well, such a star is in common use also in Israel. There is one in the Israel Druze Society website. I may add that there are at least two explanations for the colour scheme. I think the logo-flag in that site [as in the above GIF] is the author's invention by combining the two symbols [flag and star] together. Here's a photo, for the record. It's slightly different than the one depicted, including in order of colors- and note that the top arm doesn't quite touch the stripe edge.